EAST AND WEST 2 – THE WEST SIDE STORY…. This is what happens when you don’t blog for a while! You have to drop the details and limit yourself to the highlights. Since the conclusion of the “West Side Story’ on this trip, I have finished yet another chapter entitled: “Hooray Santa Fe!”. So, as I sit in Miami airport waiting for my flight back to Santa Cruz, Bolivia, I will attempt to capture some of the flavor of just my west coast adventures in this post. The West Side Story started at the ANWG Conference in Bellingham, Washington. It was followed by a stay at my friend Betty’s (author, weaver, traveler, trekking and textiles tour leader, mountain climber, tree farmer, blueberry farmer……!!) 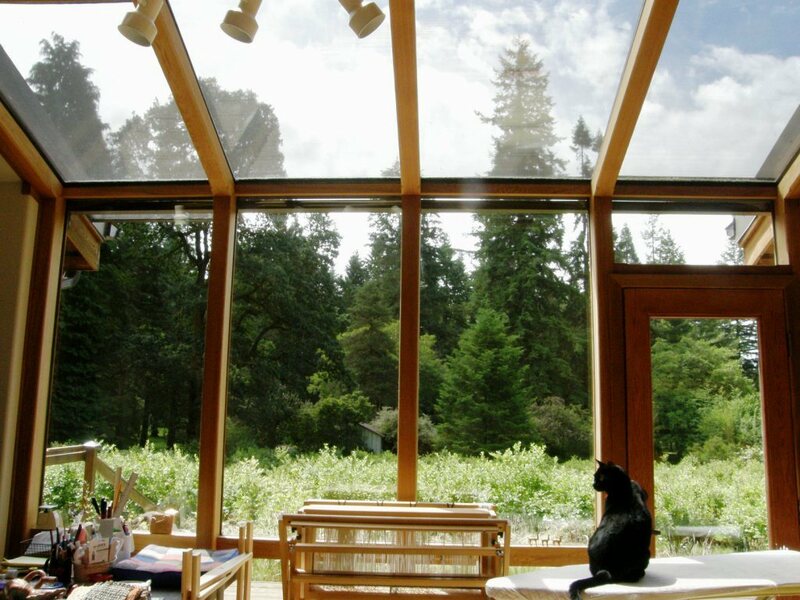 home in Washington state. There I got to meet up with one of Betty’s friends, Judith, whom I had met at the Tinkuy in Peru in 2010, as well as with Bobbie who is in the Ravelry group. This chapter finished in San Francisco after having spent about ten days at my backstrap weaving friend Janet’s farm in Humboldt County California. Janet arranged two get-togethers with weavers I had met last spring. Here are some of the members of the ANWG Organizing Committee at a pre-conference get-together. The group includes Marilyn and Linda, Sheri, with whom I stayed in Bellingham, and my wonderful roommate, Marie. I am sure that you will recognize some familiar faces amongst the teachers. It was great to meet Holly, Jane, Patrice, Paula and Marilyn at last. This was a wonderful conference. 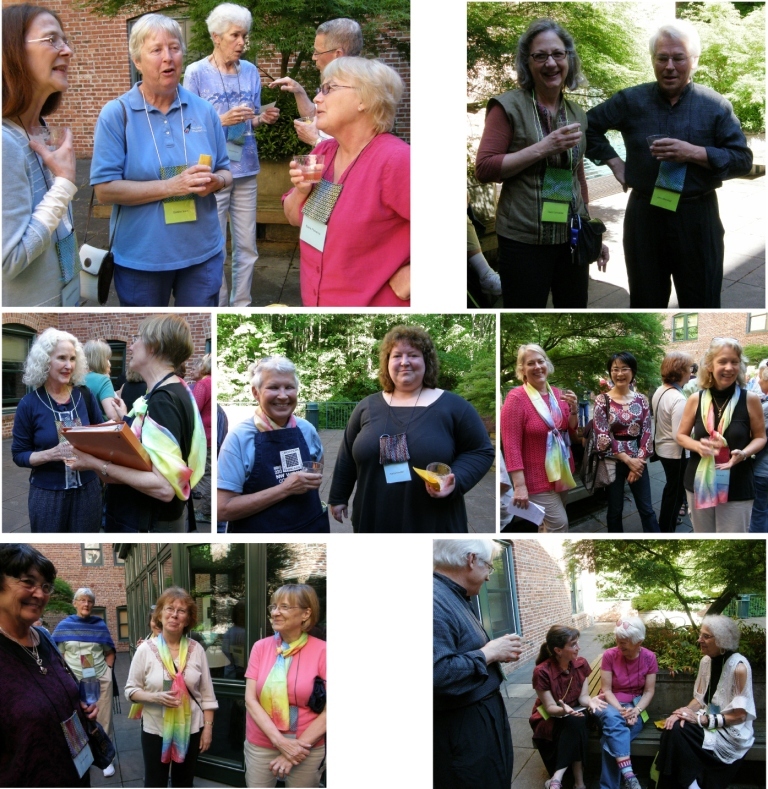 Apart from being in one place with over five hundred enthusiastic weavers, I loved the venue, the dorms, the food, our fourth floor weaving room with the view of Bellingham Bay, and all the fun details that the committee had gone to so much trouble to include. I can’t imagine that these events can get any better than this one! I loved the handwoven conference logos on the crocheted backgrounds which were hung on windows to mark the rooms which were designated classrooms. My roommate, Marie, was part of the team responsible for the handwoven pouch and name tag combo. That little pouch was such a cool idea. It conveniently held keys and meal card. Backstrap weavers found it handy for parking their sword/beater. The fabric was so very pretty. Imagine having to make over 500 of these for all the participants. And of course, there are one or two special people amongst all those that you get to meet and chat with at such events with whom you have a particularly strong connection. Marilyn was one of them. She wove with me on several days, was a committee member, taught four classes and was a whirl of energy. She seems to have an endless collection of beautiful ethnic textiles to wear and I looked forward to seeing what she would be wearing each day. 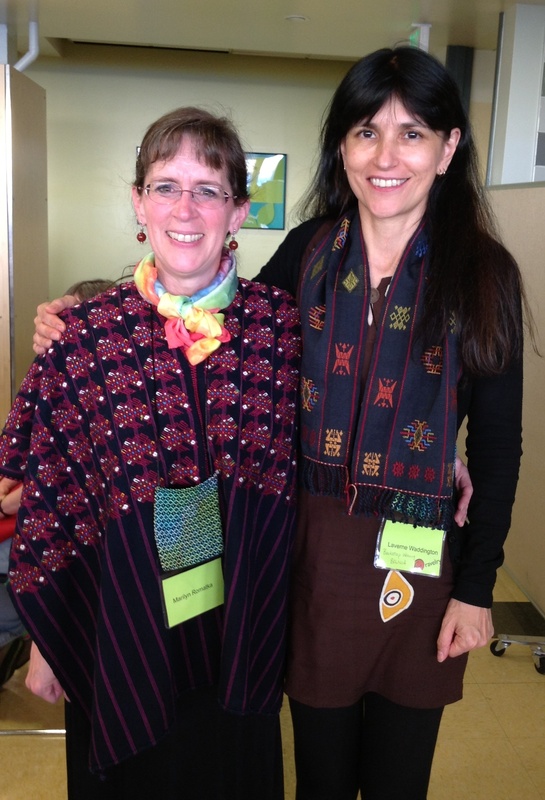 At the final banquet, we were asked to wear something handwoven. So, there you see Marilyn in a gorgeous Guatemalan huipil. I simply draped the Bhutan-inspired scarf that I wove around my shoulders. 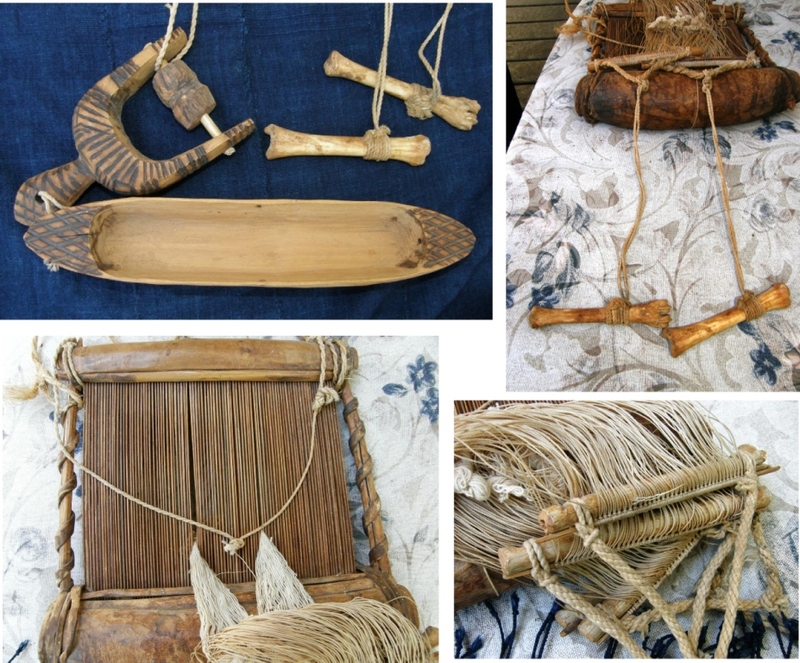 The West Side Story is also about meeting some of my online friends from the various backstrap weaving groups as well as reconnecting with weavers from past visits. Ravelry member Cindy weaving a nawi awapa band..
Cindy was also responsible for my spending in the ANWG Vendor Hall. She unearthed some Guatemalan natural dyed cotton at the Mayan Hands booth (on sale) and refrained from buying all of it! She and I bought bags of two colors and swapped. I wonder what she is planning to do with hers. 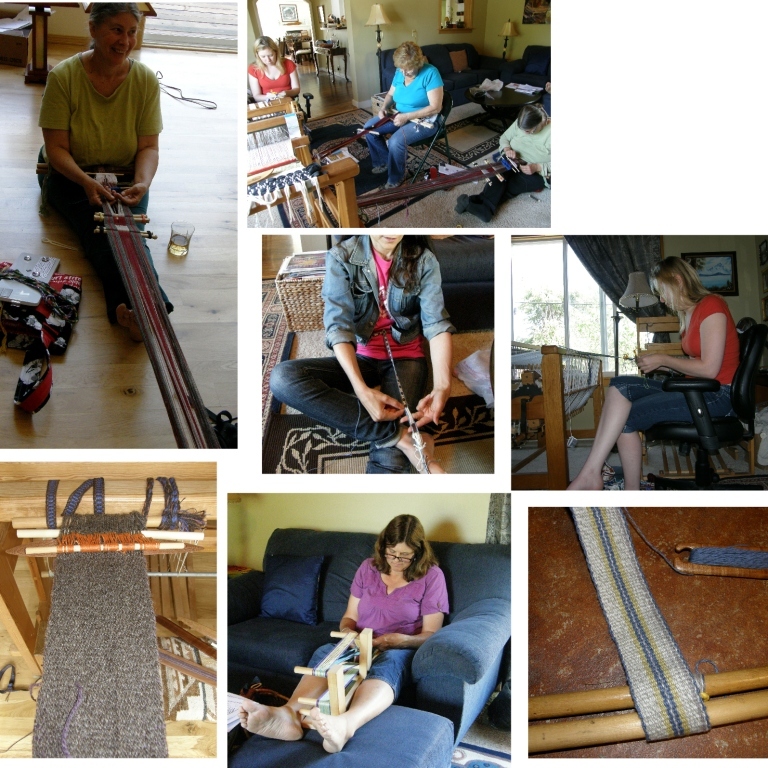 My backstrap weaving friends from Humboldt County got together too…Janet, Gina, Autumn, Ace, Pam, Buffy and Linda. 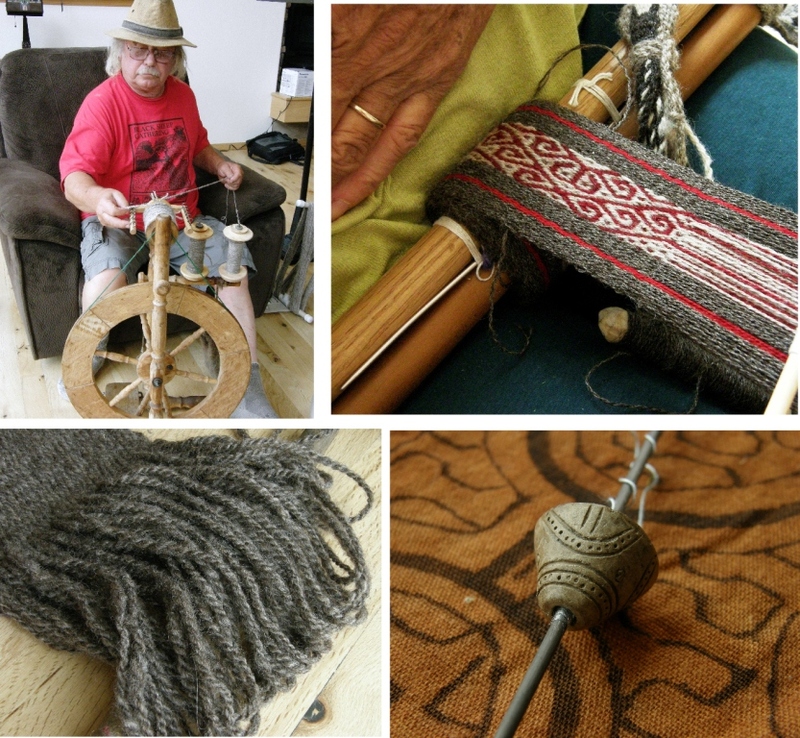 We tensioned our warps on poles, the beams of floor looms, toes and inkle looms. 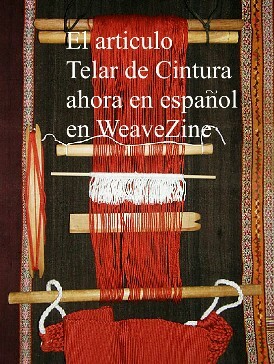 It was about playing with WOOL, something that is not so accessible in my home in the lowlands of Bolivia. And, of course, when I am with Janet and her friends, it is about lots of spinning and plying. That’s Ace at the wheel and below you can see the heavy grey yarn that he spun semi-worsted for his luxury backstrap…it made a lovely thick, cushy strap. You can see Janet working on a pebble weave band using her own handspsun worsted and a pattern from my second book. And, on the right, there’s the wee spindle whorl from coastal Ecuador that I gave Janet last spring. She has mounted it on a knitting needle and has been spinning with it. Ace is new to backstrap weaving but not to spinning and I gave him a hand with that grey wool project. I have to admit it looked hairy and scary at first! but, it was a breeze to weave with. 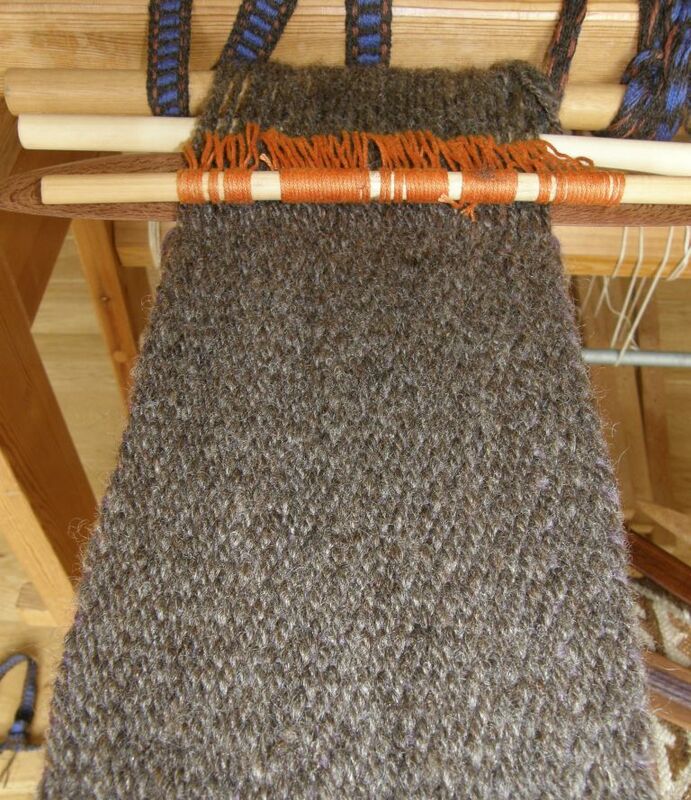 Who knew that it would weave up so well on a backstrap loom and in a warp-faced fabric? It all comes from the expert hands of the spinner and his/her preparation of the material. I got so carried away with weaving and the enjoyment of working with that lovely thick and even handspun that I wove almost to the end forgetting that Ace would want several inches of unwoven warp ends from which to make braids for his backstrap. Once off the loom he braided the ends and braided a separate cord, from his handspun of course, for the straps. Some of Janet’s beautiful naturally dyed handspun yarn which was destined for warp-faced weaving….no overspin, no kinking! It was about SUMMER, glorious summer…ripening grapes and berries, fireworks in the night sky, outdoor music, beaches and sunsets. The view while lying in bed in Betty’s studio looking out on her tree farm and bushes with ripening blueberries. Sunset over the mountains in faraway Canada on the final evening of ANWG in Bellingham. The cool and enticing raspberry jungle at Janet’s place. My poor, but kind- of -interesting, attempt at photographing the fireworks during my first 4th of July in the US. Beautiful patterns in light and dark sands on the beach at Shelter Cove near Janet’s place….Humboldt County…sigh! 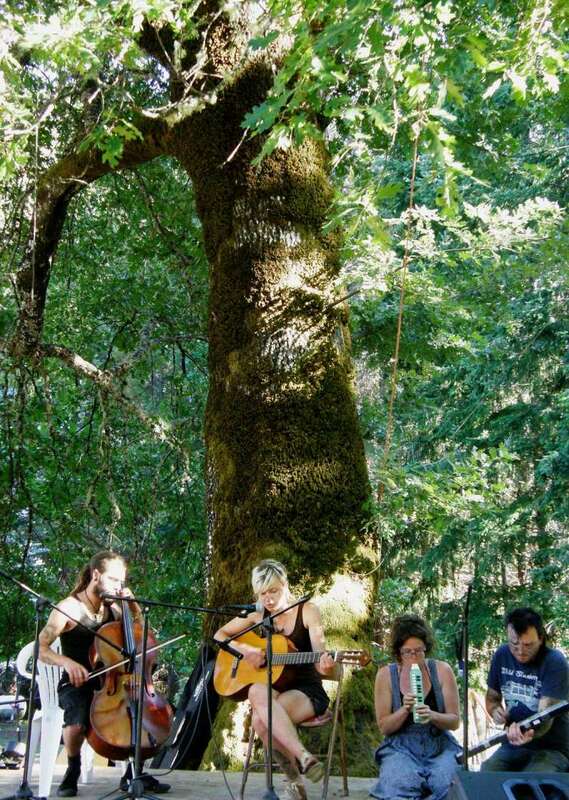 Music under the big ol’ white oak…the annual”Strawberry Jam” at Janet’s place. I hooked up a warp to my toe, wove and enjoyed the music. And there were textiles!! I was lucky that my visit with Betty coincided with a visit from Betty’s good friend Judith.She had come down from Canada to take a spinning class from Judith MacKenzie McCuin and stopped for a day to visit. She had brought with her the most exquisite textiles from a trip she had taken to Indonesia. Judith lays out the textiles under the supervision of Trouble the cat. 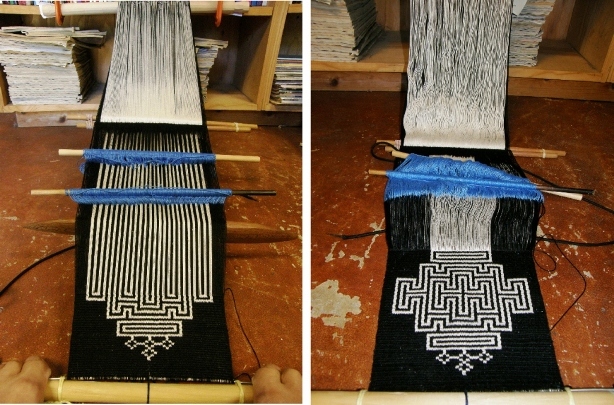 Woven on a backstrap loom, this piece has both the warp and weft threads patterned using the ikat technique. 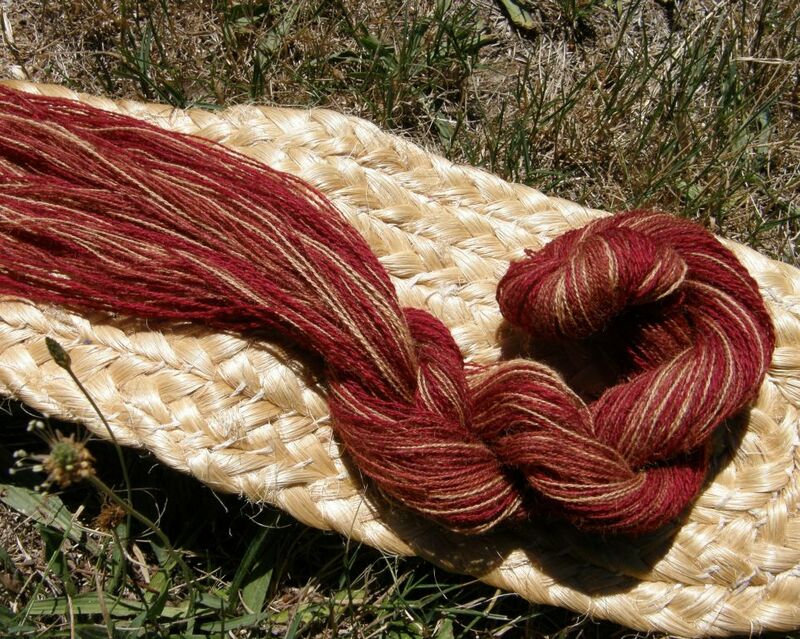 The cotton thread is handspun. 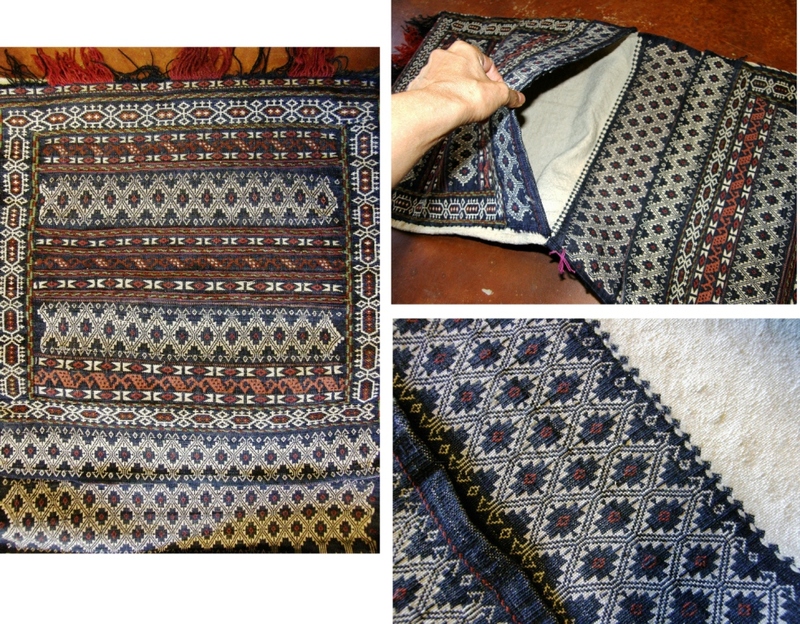 Judith tells me that this is known as “Magic Cloth” and comes from the Tenganan Bali Aga Community in Bali, Indonesia. And, speaking of warp and weft ikat, I have to show you the jacket that Linda LaMay enetered in the juried show at ANWG. Linda wove with me over several days. She happened to be in the Gallery on my visit and allowed me to photograph her with her piece that was given the Complex Weavers Award. Her piece also won 1st prize for being the best representation of the conference theme: Crossing Threads, Crossing Borders. 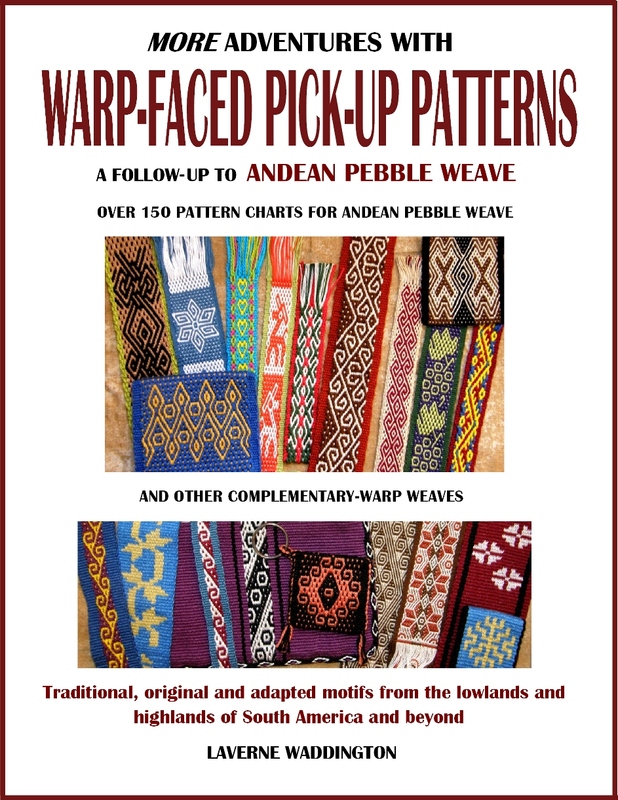 Linda had bought a pre-tied and dyed ikat or, jaspe, warp in Guatemala…one which had been designed for warp faced fabric. 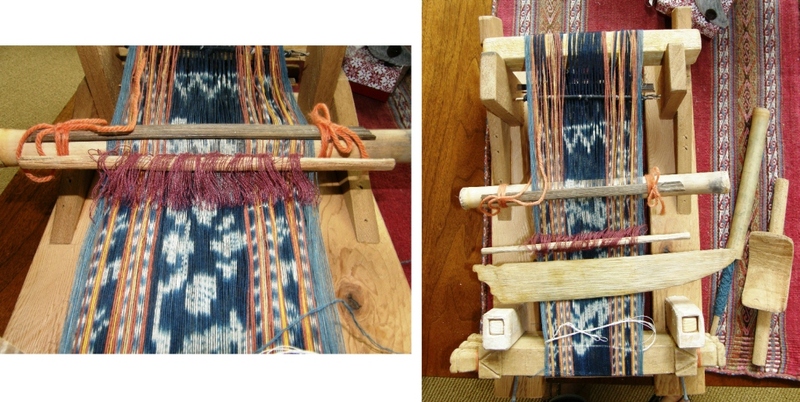 Linda, however, wove it as a twill exposing both warp and weft and, in order to do this, had to dye the weft herself and then carefully place it to match the dyed pattern in the warp….she painstakingly transformed it into warp and weft ikat…amazing. Another textile in Judith’s collection, this one from Sumba, Indonesia…all the elements that I love!…weft twining along the bottom and simple warp floats to create creatures that are mirrored in the central ikat section. 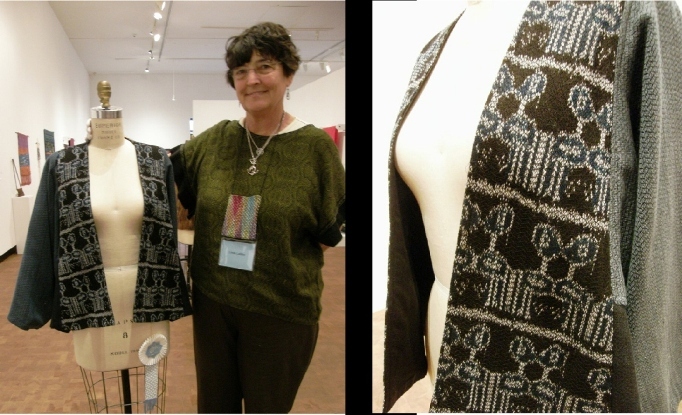 And, speaking of twining, let me show you the ravenstail work that John Beard showed in the Instructors’ Exhibit at ANWG. He kindly gave me permission to show it here….spectacular. And, speaking of the warp floats in the Sumba textile, let me show you a textile that ANWG instructor and fellow Australian Kay Faulkner collected in her SE Asian travels. She brought this to ANWG to inform and inspire her students in her workshop entitled “East Meets West”. 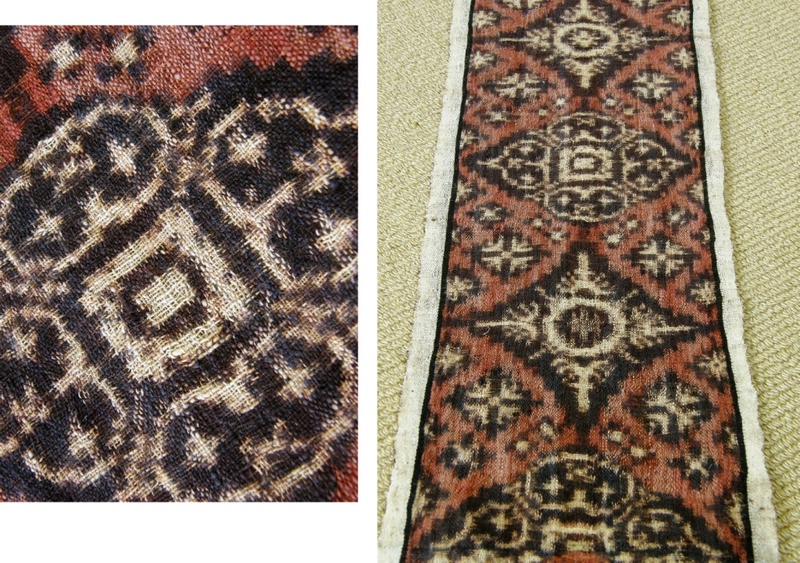 Both faces of this textile have warp float patterns . Kay and I had fun comparing and contrasting spotty pebble-like structures and she came over on the last day with Bhakti Ziek so that we could have even more “pebbly” conversation. If you look very carefully at the piece Kay brought, you will see that there are weft floats amongst the warp floats. I just gaze and gaze at this Selendang shoulder scarf of Batuisi, W Sulawesi from Judith’s collection. 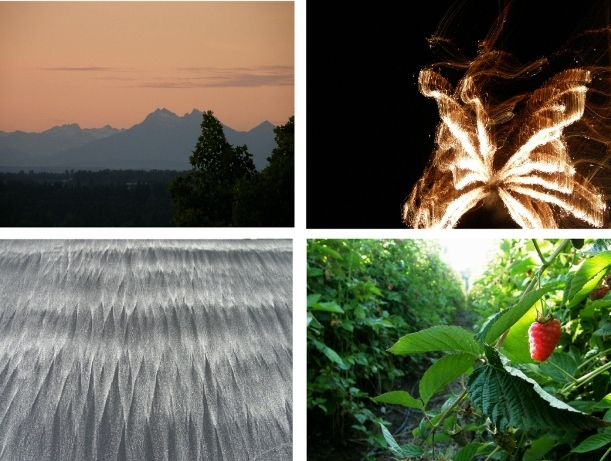 The colors all come from natural sources. 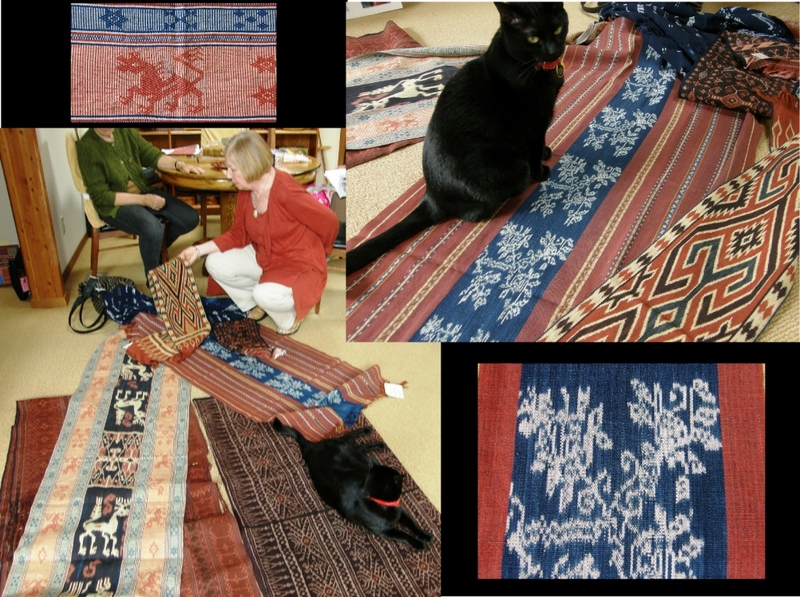 The yarn used was heavier than that used in other Indonesian ikat pieces that I have seen. I really liked the feel of this piece. There are more of Judith’s textiles to show but I think I will save them for another post. 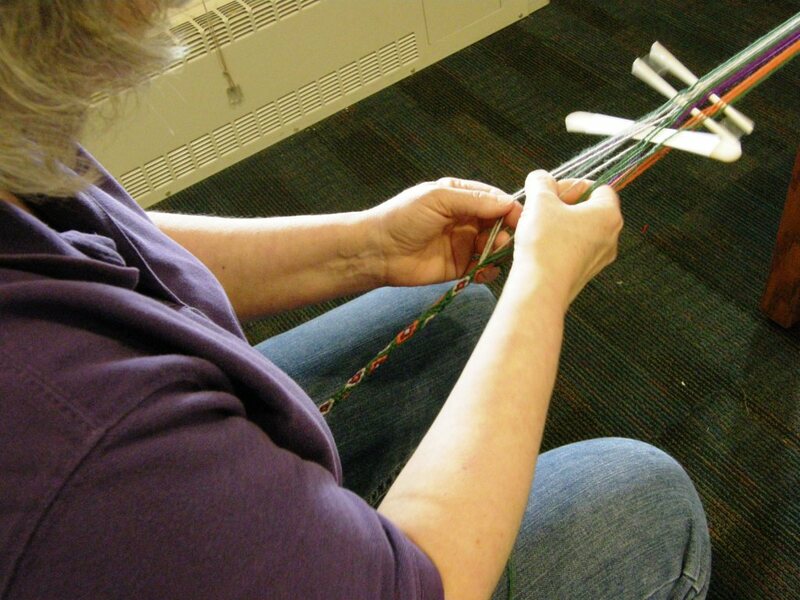 Let’s look at the miniature backstrap loom that she got in Indonesia instead. 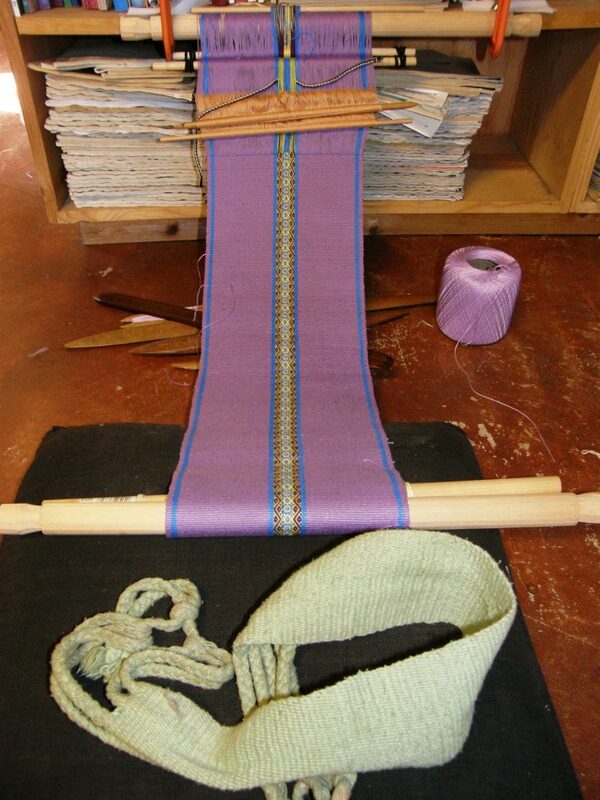 I am always intrigued by new-to-me pieces of equipment that the various backstrap weavers aroud the world use and this loom included such a piece which may hold one of the many secrets of how backstrap weavers go about keeping the ikat-patterned warp threads reasonably aligned. What a sweet little loom with its circular ikat warp in place. It was a great opportunity for me to take a close look at one of the Indonesian backstrap set-ups. The miniature wooden backstrap is so cute! I love the carved pieces that serve to clamp the circular warp. Beyond the heddles and shed rod, the warps that had been tied and dyed were separated along a stick which was wrapped. The wrappings seemed to separate the warps into the sections that had been tied for dyeing. I am wondering if the wraps also serve to squeeze the warp threads into groups and therefore help stop the from moving excessively and blurring the design too much. And, while on the subject of simple looms from far away places, let me show you a loom that a lady in Arcata, CA showed us when our weaving get-together group went to the Farmers Market. A friend had brought it back from Africa for her with accompanying postcards that showed how it was set up. The postcards said Upper Volta and were written in French. 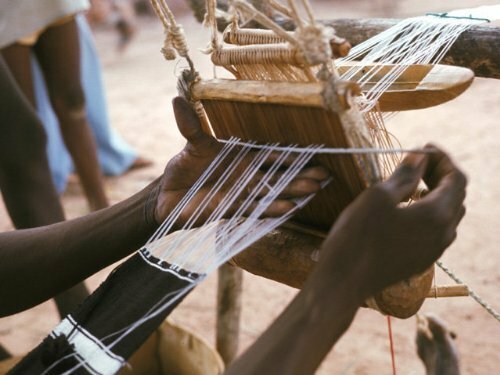 This, according to Wiki is today’s Burkina Faso and it seems that the people who use these looms are called the Mossi. The loom pictured at left is from this page. It has some beautiful parts which include bone foot toggles for operating the shafts and a fine reed framed with what could be wood and horn. The carved wooden pulley system and shuttle were lovely as was the indigo-dyed cloth strips that had been sewn together. I used this as background for one of the pictures. It’s for sale…tempting! Back at Janet’s I enjoyed a chance to do some weaving of my own. 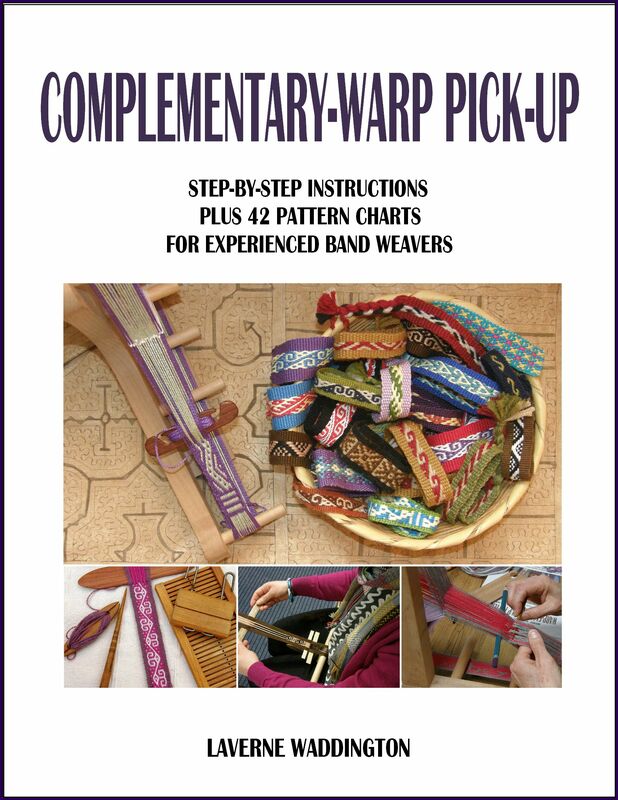 I got to work on the two warps that I had brought with me. I have to say that I was happy to get this one off the loom as I do not care for it at all! I am going to use it to practice and learn some new sewing skills. Maybe I can shape it into some kind of interesting bag. This is the warp that I wove while visiting at the Mannings’s annual Spinning Seminar last month. The pattern is one that I have woven many a time and observers’ reactions while I was weaving it inspired an addition to my FAQ pages…this new one being about following and ceasing to follow pattern charts. 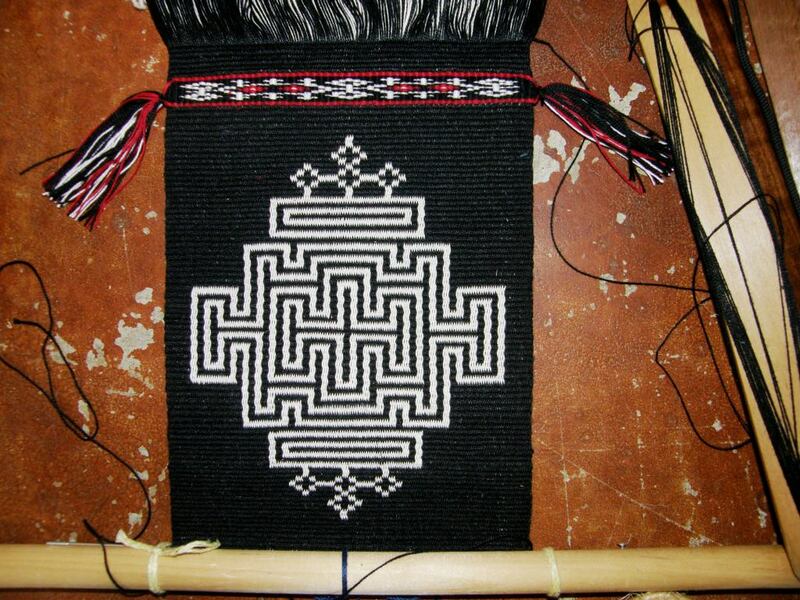 Next up was the piece on which I am weaving a Bhutanese design called “labyrinth”. I am weaving it using the two-heddle intermesh technique that I teach in my second book. 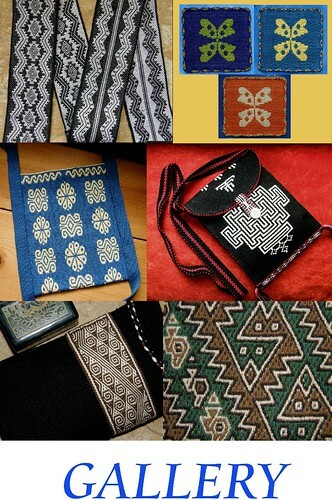 The pattern is from David K Barker’s first book of Bhutanese designs. 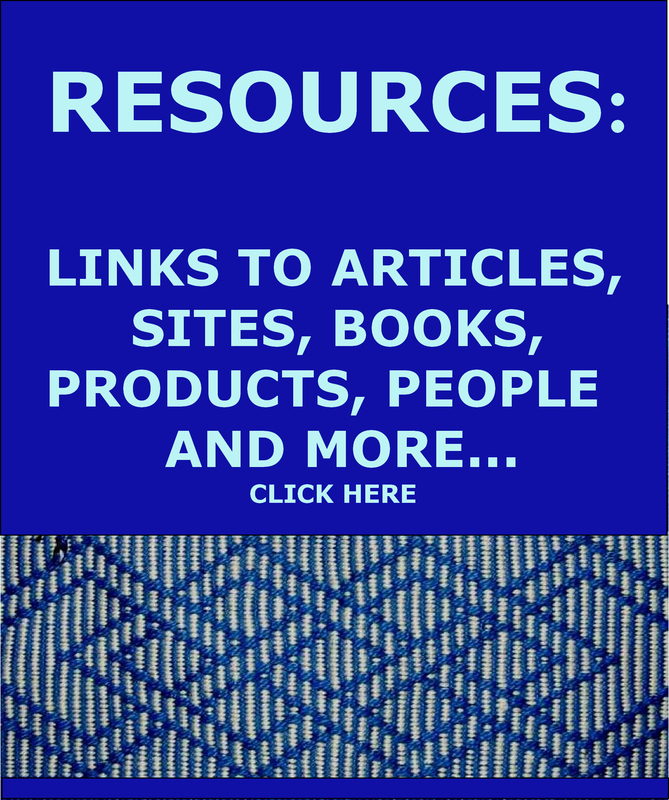 Look at my RESOURCES page to see how you can download this free book. I never plan these ”traveling” warps to actually be anything knowing that my weaving on them is generally so interrupted and disjointed. However, I got to sit and weave on this quite a lot at Janet’s and had it set up in a very similar way to the way I usually like to weave. I lodged the far loom bar behind clamps on a low book shelf and moved the books and magazines around so I could extend my legs within. The angle was just right for me. With a pillow added on the floor, I was right at home. Once the first large motif was complete and I could see that this could actually become something, I had to decide what would come next. Inspiration came in the form of a double-pocket saddle bag quite likely from Afghanistan. Janet bought it in a local shop of ethnic artefacts and it is gorgeous! 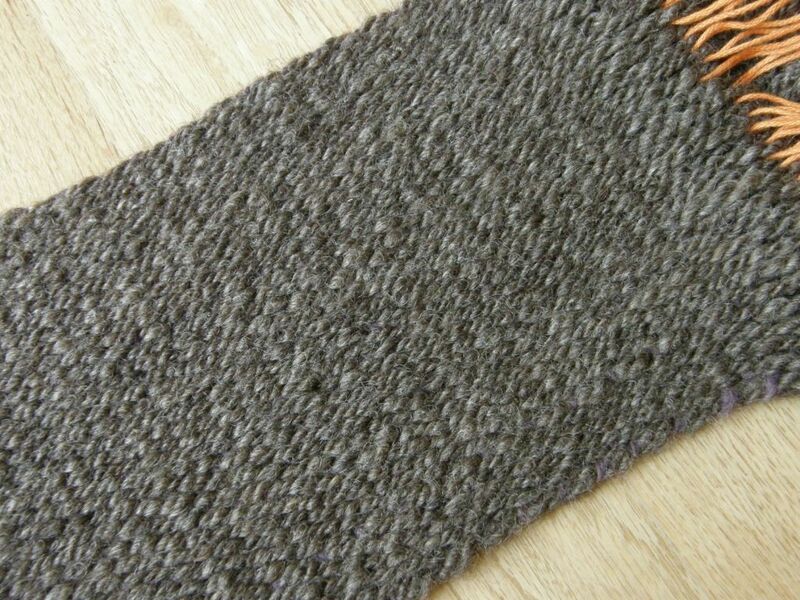 It is woven with wool and largely patterned using weft substitution technique which results in floats on the back. However, the kinds of patterns used in this piece do not create overly long or unruly ones. 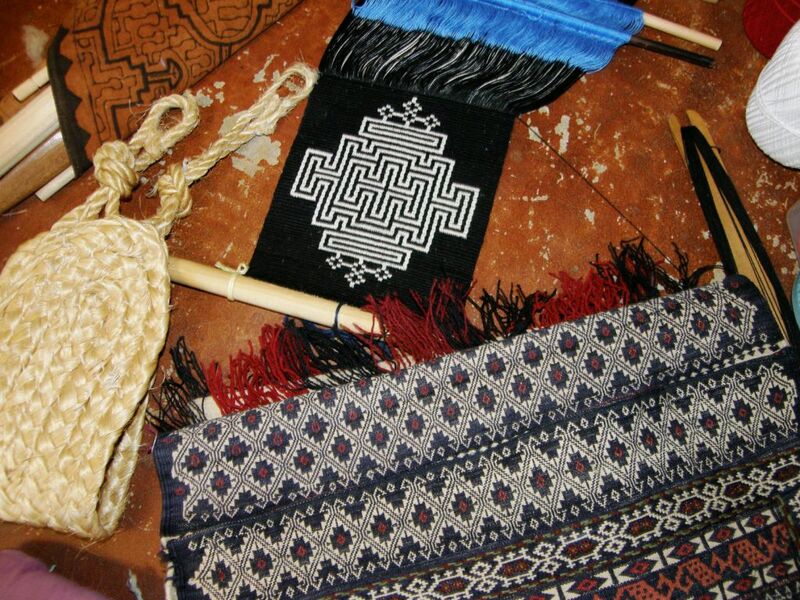 There are all kinds of soumak and warp-wrapped patterns as well. The fabric is incredibly stiff and tight…made to last a long, long time, no doubt. Those reds and blues…love them! The back of the bag, which would be against the animal’s back, was not patterned. 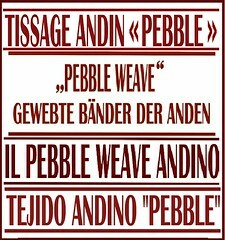 Janet and I were both astounded when we realized that the plain cloth was not a separate backing but, rather, a continuation of the weaving in an extremely tight and very well balanced plain weave. I would bet that this bag is waterproof. So, this is pretty much where I am at so far with this latest piece of weaving. I just started some vertical warp-wrapping for the back side which I haven’t photographed yet and I have chosen a motif for the center of the back…it’s going to be a bag (of course! )…black, white and red (of course!) and it is going to get seriously dressed up with tassels and trims. This will be something nice to dive right into when I get back home (that will be soon, I hope. I am writing this in Miami airport). Next up on my blog…Santa Fe and the International Folk Art Market…it has been one of my dreams to see this. Visiting Santa Fe also gave me a chance to hang out with several weaving buddies that you will have already met here on my blog. I can’t imagine a better place to have gotten together with them and we are wondering how we can possibly top this! Of course it inspired all of us but the funny thing is… one of my best ideas came from something I saw in the American Airlines inflight magazine on the way to Miami…funny how these things work! See you next time. The textiles, oh the textiles! How I wish I could see them all in person. Just fascinating. And those looms, how interesting. It was great to finally meet you at ANWG. I think my cotton from Mayan Hands will become a top of some kind. Haven’t planned any details yet. Glad I could enable your spending. I also own a new book, thanks to you. I’ve read it cover to cover. So many beautiful and inspiring woven pieces! It is so much fun to see such an amazing variety of work – so many skilled artists. And how interesting to see the different looms – how creative people are to come up with different ways to cross yarns! 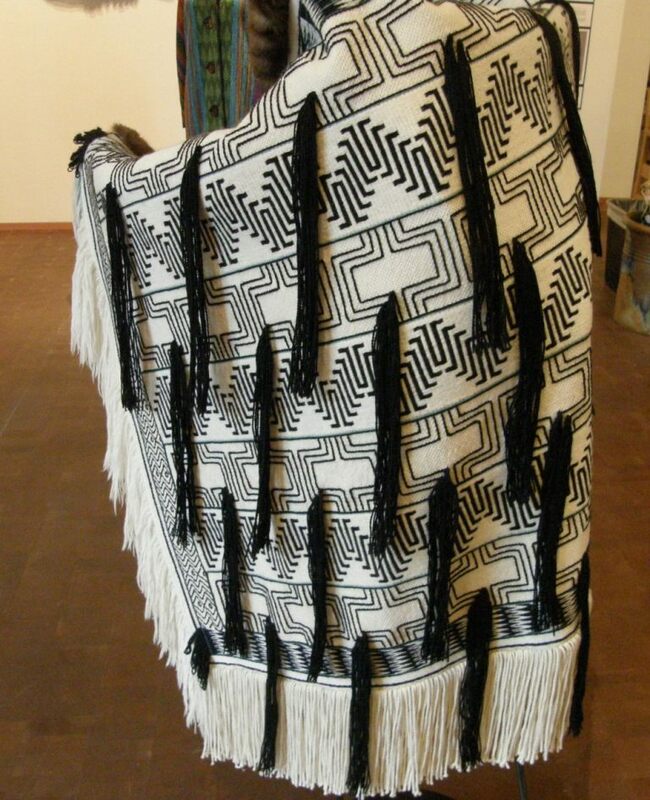 Your black and white Bhutanese inspired weaving is absolutely stunning, Laverne! Hope your travel homes go well. I found you Julia! That’s a deal to wear purple and carry my nawi awapa band. I’ll put mine in the packing pile right now! Beautiful little African loom. I’ve been interested in making one, so thanks for the close ups. Is it used for kente cloth? That saddlebag is almost unbelievable. Such details! Thank you for the post.